* If you do not yet have any sourdough, use the following procedure to make it yourself from microorganisms (lactobacilli and yeasts) found in the flour and in the air (the weather should not be hot): Mix 60 g of flour with 85 g of water and leave it covered with a towel for 1 or 2 days (stir it gently once or twice during that time) at 25° C (77° F), until bubbles appear at the surface and it smells a little sour. Refresh this starter sourdough a couple of times according to steps 1 to 3 to get a strong sourdough leaven, the first time using slightly higher temperatures. Add 150 g of flour and 90 g of water and mix everything. Sprinkle flour on it and leave it covered for 14 hours at 20° C (68° F). You now have a large amount of fresh rye sourdough*. Take 30 g of it and store it in the refrigerator for the next time. 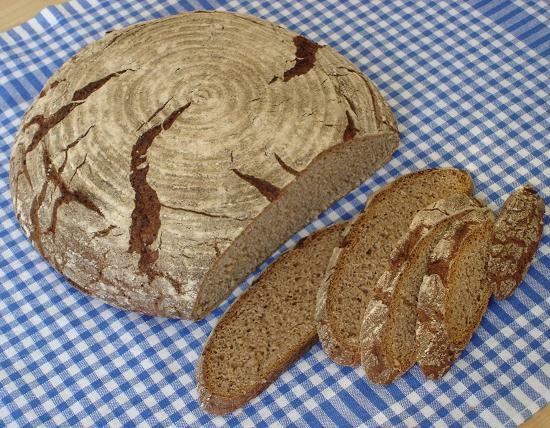 * There are several methods of preparing rye sourdough. The three-stage progress described here (beginning with a humid stage to increase the yeasts and a cool stage to generate acetic acid) is based on the traditional German method of making sourdough. Put 400 g of flour into a bowl, add the sourdough, 285 g of warm water and 16 g of salt. Knead strongly for 10 minutes. Then leave the dough covered for 30 minutes at 27° C (81° F). Put the bread on a rack to cool until the next morning. The weight of the bread is about 1400 g. To eat, cut 1 cm slices and spread butter on them, for example. Only cut as many slices as you want to eat at a time. Keep the bread in a dry place (not in the refrigerator, and not sealed) with the edge you cut from down. The bread stays fresh for about a week. Enjoy the taste of rye! Mixed flour bread: Replace some or all of the rye flour in steps 4 and 5 with the same amount of wheat flour (bread flour / strong flour / type 55 / type 550). For every 100 g of wheat flour reduce the amount of water (in step 4) by 10 g and the baking time (in step 6) by 5 minutes. You can cut slashes on the top just before baking to increase the amount of crust. If you use a high amount of wheat flour it may be necessary to use a lower baking temperature in the beginning or to turn it down earlier. The bread stays fresh for a couple of days. Seasoning: In step 4 add a small amount of some of the following ingredients to the dough: coriander, caraway seeds, fennel, sesame seeds, flax seeds, sunflower seeds, pumpkin seeds. (Adjust the amount of flour and water if necessary). Or put caraway seeds, rolled oats, sunflower seeds, sesame seeds or poppy seeds on the top of the bread in step 5.